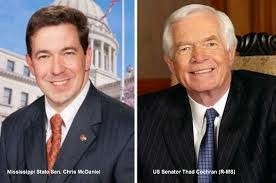 Thad Cochran should be careful to not let the door hit him in the arse on the way out. PEARL, Mississippi — A new poll shows that state Sen. Chris McDaniel has surged even further ahead in the final days of his GOP primary runoff against Sen. Thad Cochran (R-MS), in what has become one of the most epic bouts to date between grassroots conservatives and the GOP establishment.McDaniel has taken a 52 percent to 44 percent lead over Cochran, while four percent of voters remain undecided in a new tracking poll by Chism Strategies. The poll, conducted on Friday night, surveyed 697 GOP primary voters and has a margin of error of 3.8 percent—a number McDaniel’s 8-point lead is well outside of.